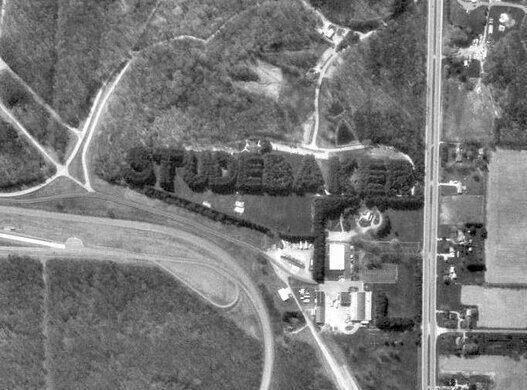 Planted in 1938, the Studebaker sign in Bendix Woods was once recognized by Guinness World Records as the world’s largest living advertisement. In its prime, it contained 8,000 red and white pine trees. After 75 years with no maintenance, it has thinned out to just 2,000 but is still visible from the air. Back in 1926, the Studebaker Corporation built what it claimed to be the first closed testing facility for an American car company. 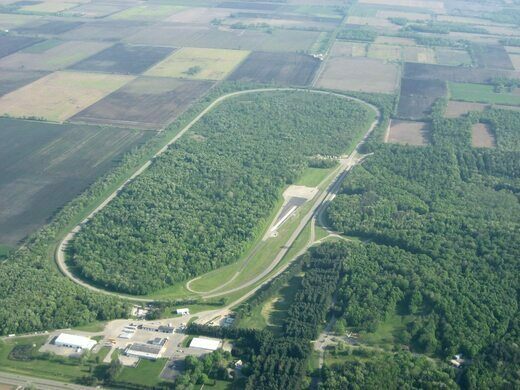 The automobile manufacturer, founded in 1852, spent more than one million dollars on the test facility, which included a three-mile circuit with a variety of special test sections including hill climbs, skid pads, snaking curves, and bumpy roads. Naturally, if you’re going to spend a million dollars on a test circuit, you might as well invest a little more on a giant living sign made out of pine trees that’s only visible from the air, so that’s what Studebaker did. In 1938, the company, with the help of the Civilian Conservation Corp, planted 8,259 six-inch seedlings in an area extending about 2,000 feet. Together, these seedlings spelled out the word STUDEBAKER in letters more than 250 feet tall. Initially, the letters were nicely ordered, well defined and maybe even a little skinny. 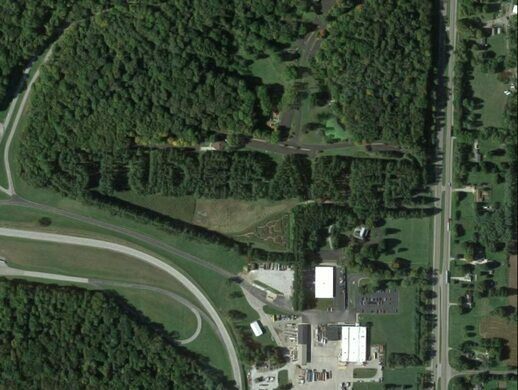 They were easy to read from the air, which is exactly what Studebaker intended. The sign was a salute to the growing aviation industry and a handy publicity stunt that could be seen by overflying aircraft passengers. Over the years, of course, the pine trees grew and so did the letters. Studebaker, on the other hand, started to wither away. After years of financial problems, the company closed its last remaining production facility in 1966. 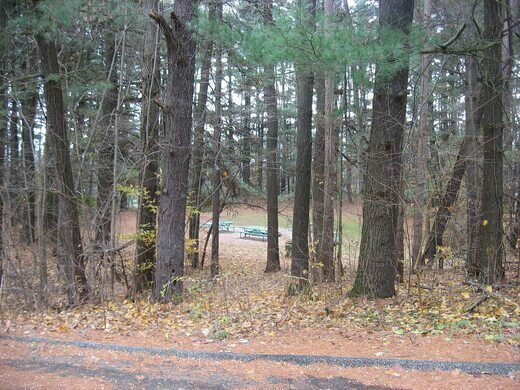 Studebaker sold the land on which the trees stood to the Bendix Corporation, which donated some of the property for the creation of a county park (hence its current name: Bendix Woods County Park). 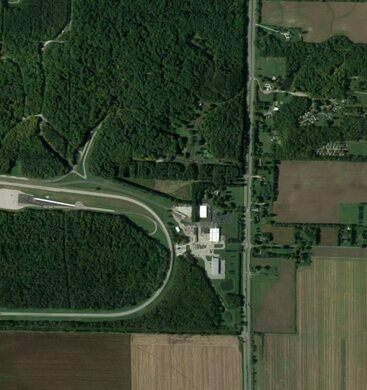 Parts of the testing grounds were later purchased by Bosch and Navistar. Despite the demise of its namesake company, the Studebaker sign remained. In 1985, it was included in the National Register of Historic Places. Two years later, it first appeared in the Guinness Book of World Records as the world’s “largest living advertisement sign” (a record that no longer seems to exist). By the start of the new century, the Studebaker sign was looking a little shabby. Invasive plants and storm damage, most notably an ice storm in December 2004, had caused significant wear and tear to the trees. Fortunately, a series of grants were soon awarded for the restoration of the Studebaker sign. Between 2012 and 2015, volunteers helped remove dead and diseased trees and planted 2,000 pine saplings in their place. All this has ensured that the Studebaker sign will keep standing-and growing-for the foreseeable future, for all to witness and admire. Well, at least on Google Earth or from the window of an airplane. The first artificial white water river course in North America cuts right through an Indiana city. Largest illuminated advertisement sign in the world.